Making strides: Can the Chicago Pedestrian Plan make mean streets safer for pedestrians? This June evening is too pretty for the subway, so I bicycle south to the Pink Line’s California station to meet up with the Active Transportation Alliance’s Tony Giron. He’s leading a march across the largely Mexican-American neighborhood of Little Village to Farragut High School for the first of seven public input meetings on the Chicago Pedestrian Plan. 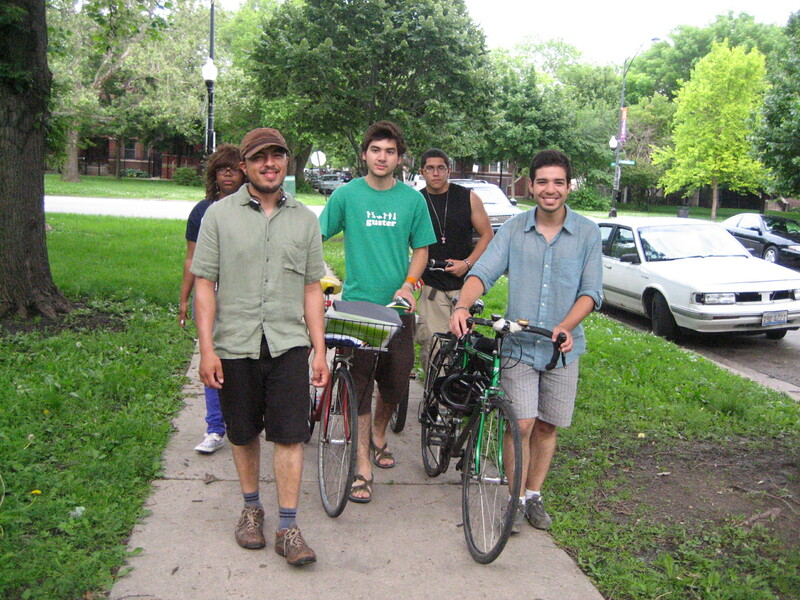 Joined by a handful of young Active Trans interns and volunteers, we walk our bicycles west down leafy 23rd Street, past families hanging out on stoops and vendors selling paletas and elotes as Norteño accordion music plays on stereos. When we arrive at Farragut a man on an adult three-wheeler with a hubcap-covered sound system on the back is pedaling around the schoolyard, trailed by kids on BMX bikes and tricycles. Inside, various city agencies and nonprofits have set up info tables. CDOT’s display features a “pedestrian toolbox” of strategies to make foot travel safer: countdown walk signals; pedestrian refuge islands; bump-out curb extensions to shorten crossing distances; “road diets” which slim streets from four to three lanes and more. 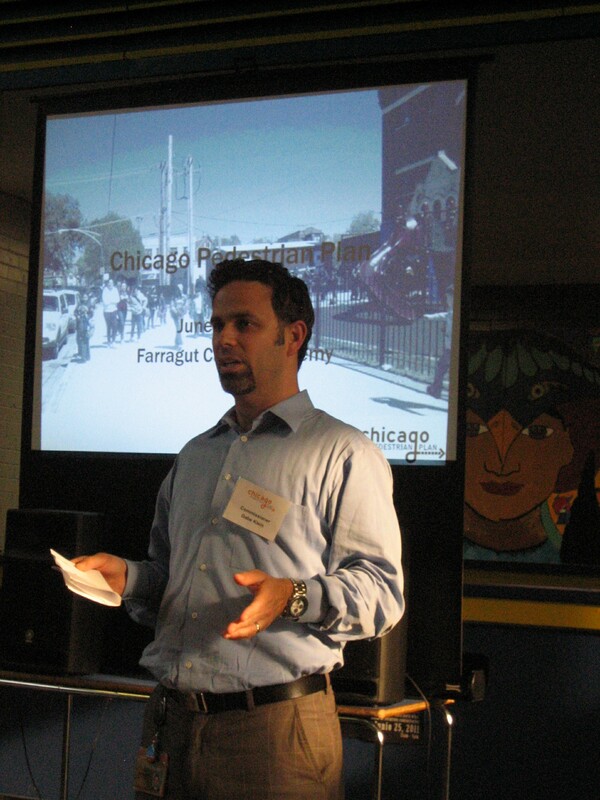 Soon new CDOT commissioner Gabe Klein addresses the audience of forty attendees. Although he’s only been on the job for a few weeks, Klein is already a darling of local walking, biking and transit fans because of the aggressive, possibly unrealistic, green transportation agenda he and Mayor Emanuel are pushing. They’ve pledged to create bus “rapid transit” lanes, extend the Red Line, build 100 miles of car-separated bike lanes, create a robust public bike-sharing system and build the Bloomingdale Trail elevated greenway in only a few years. They’re also promising to level the playing field for walkers with fewer right-on-red intersections, plus traffic signals that give pedestrians a three-to-five-second head start before cars get the green. In addition, the city plans to create “pedestrian scramble” intersections where motorized traffic stops completely for fourteen seconds, allowing walkers to cross in all directions, including diagonally, at the same time. “Everybody’s a pedestrian sometimes,” says Klein. He argues it’s critical for Chicago to protect vulnerable road users, like the 8-year-old girl who was killed by a hit-and-run SUV driver last week as she rode her bike in front of her Southwest Side home. “We want to put [the pedestrian plan] together expeditiously so we can have an impact as soon as possible,” he says. CDOT will draft recommendations and an action plan by the end of the year. The next public meeting for the Chicago Pedestrian Plan takes place on Wednesday, July 13, 6pm-8pm at Austin Town Hall, 5610 West Lake.